IP (Internet Protocol) camera surveillance systems offer many benefits and advanced functionalities in security technology. Advances such as superior image quality, remote accessibility, scalability, intelligent design and reduced costs are driving more companies to migrate from legacy analog to IP surveillance systems. IP systems transmit data through a network and/or the internet providing remote administration and real-time monitoring from anywhere in the world. Data is recording digitally rather than converted from analog to digital resulting in up to 25% more resolution than analog cameras. On-board processors enable network cameras to analyze and detect events through things like facial recognition and motion detectors in real-time, providing alerts about suspicious or criminal activity & overlook benign matters. Such functionality can also be used to increase efficiencies for non-security applications such as deliveries or workflow monitoring. IP video systems can provide privacy by encrypting data and eliminating the need for expensive fiber optic cables. Innovative technology increases protection of property, employees, customers and assets. Superior image quality, PTZ (pan, tilt & zoom) functions and digital storage organization simplify monitoring and retrieval, providing reliable evidence in the event of a crime or accident. Possible integration with automation systems and network systems such as point of sale, ATMs, fire security, lighting, etc. Ability to add one camera at a time without purchase of recording equipment. Hybrid recording systems allow expansion with IP cameras while continuing to use existing cameras, without having to replace the entire system at once. There is a significant cost savings when utilizing IP Camera security systems over analog systems. Analog security systems can be easily converted to an IP Camera system using existing network infrastructure and do not require additional cables like analog systems. Higher resolution images and an expanded field of view, reduce the number of cameras needed. One IP camera can often replace 2 to 3 analog cameras. IP Camera systems use standard server hardware and IP-based networks to communicate data rather than expensive equipment such as DVRs and monitors required for analog systems, reducing management and equipment costs. A network video system can be expanded one camera at a time, while analog systems typically need to be increased in groups of four or sixteen at a time. 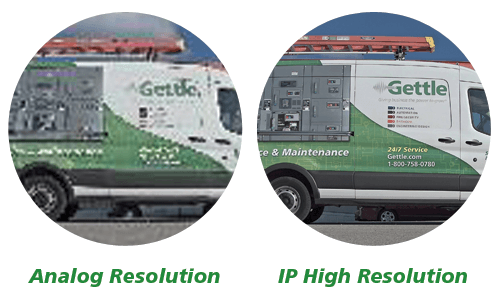 Whether you need one camera or a multi-site surveillance system, Gettle offers turnkey solutions, from on-site assessment and system design to installation and monitoring. Gettle’s experienced team of industry-certified (ESA and NICET) security experts use the latest technology to customize security solutions that best-fit the needs of each client. Contact us today to learn more about IP camera solutions for your business.